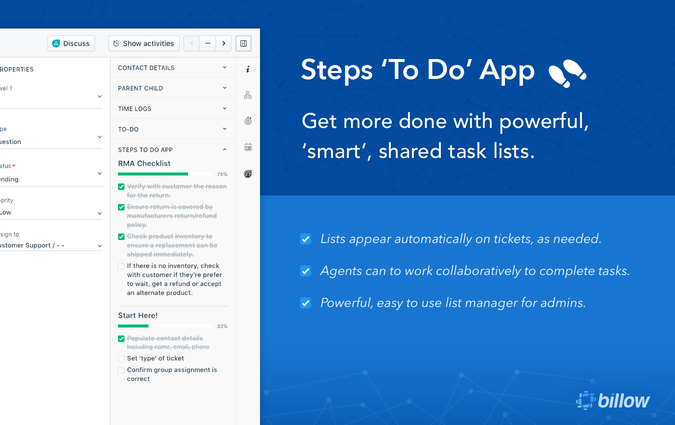 Create powerful workflows and get more done with 'smart', shared task lists. The Steps app is a 'to do' app built around shared tasks and task lists. 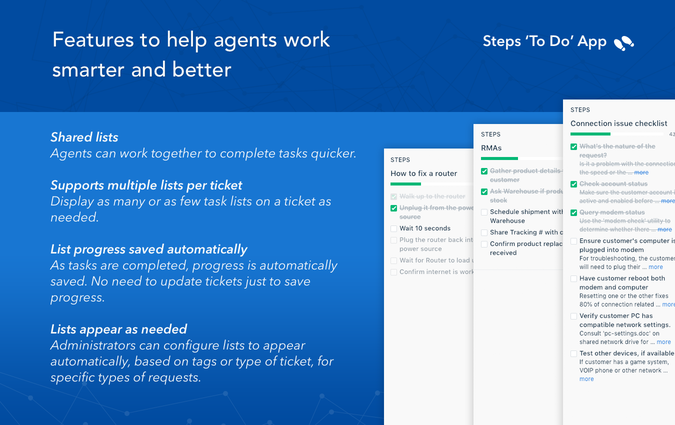 It's been designed to help you create structured task-based workflows around tickets. This helps ensure agents follow your organization's policies and processes when responding to tickets. It also allows agents to work collaboratively to complete tasks. Task lists within the Steps app are 'smart'. This means admins can set specific conditions for when task lists should appear (ticket type and tags at the moment, with additional fields and properties planned). With the help of Dispatch’r business rules, Supervisor actions and Scenario Automations, tickets can easily be tagged so the right lists appear at the right time. The app includes a powerful and easy to use list manager. 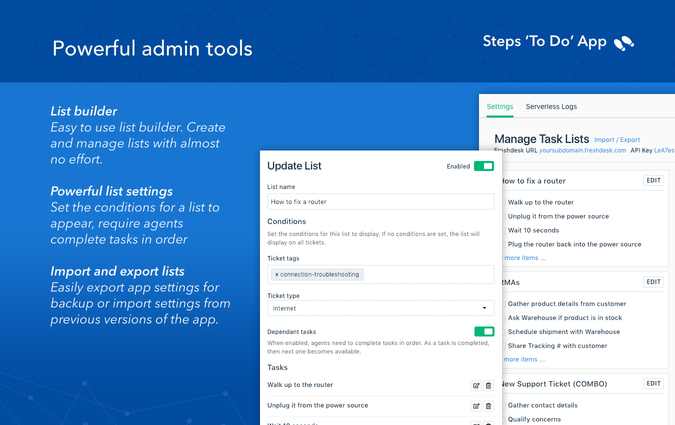 Admins can quickly create or modify task lists, set advanced options for lists, and export app settings for offline backup. API key: You can find your API key on your use profile page. Click the user dropdown menu on the top right of the Freshdesk interface, then select Profile settings. On the next screen on the right hand side, you'll see a text box labelled Your API Key. Select and copy that value. With this information, you're ready to proceed. Click Install and enter your subdomain and API key them click Save. Once saved, this information will be displayed near the top of your app settings screen. To create a list, simply click the New List button. You'll be presented with a dialog. Enter a list name, the conditions for when to display the list and your tasks.